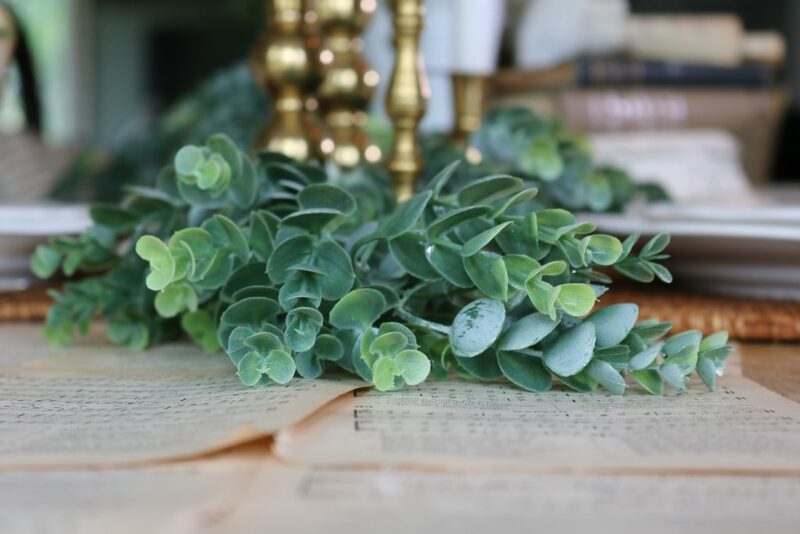 Vintage books are beautiful pieces of history and offer an inexpensive yet easy way to decorate for any season. 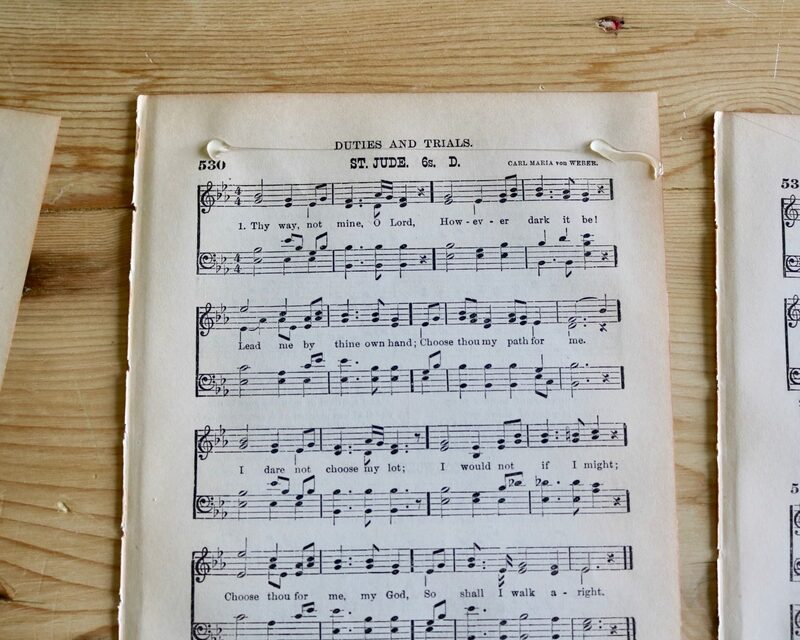 I was inspired by an old hymnal that I found for $2 at a thrift store to decorate my Easter table. 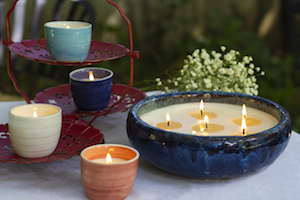 It is about giving new life to something old or tattered. 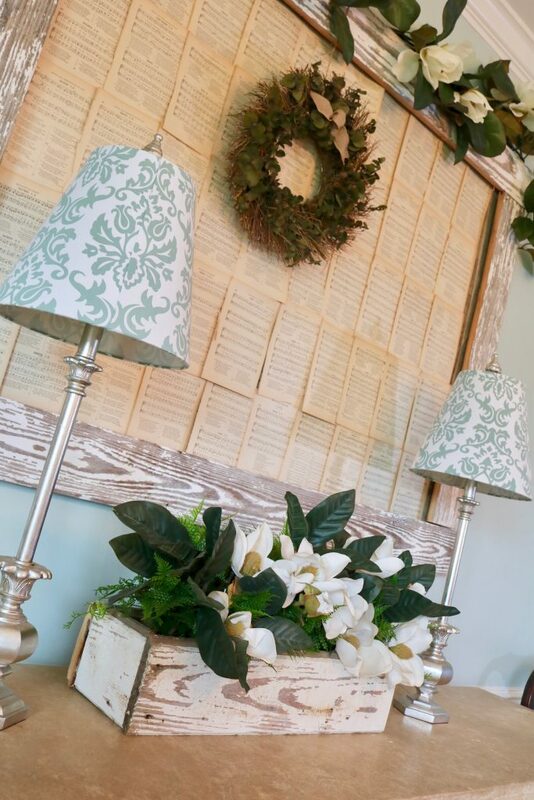 There are many ways to decorate with vintage books, so I chose a few different ways to use them in my decor. Easter is not about the bunny, but the Lamb. So while I do enjoy a chocolate bunny, creating Easter baskets and hiding eggs for the kids to hunt, I believe it is important to remember the true meaning of Easter. The resurrection of Christ symbolizes the eternal life that is granted to all those that believe in Him. 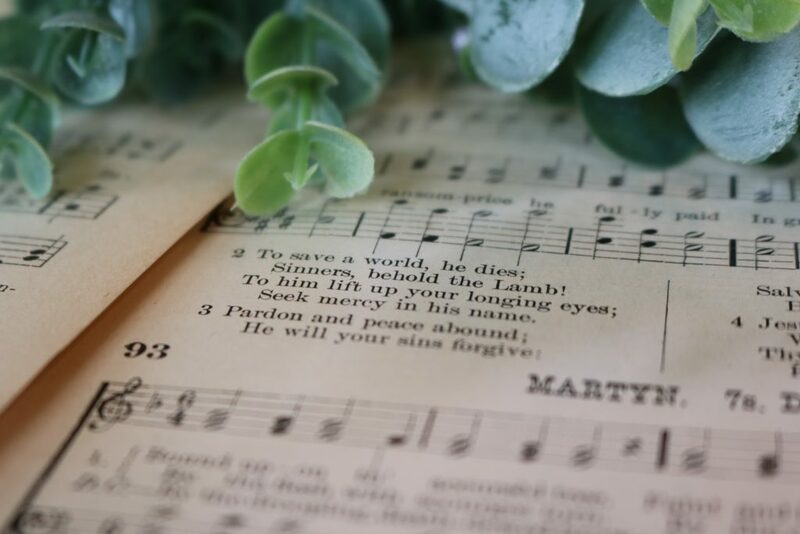 When Christ, the perfect Son of God, a Lamb without spot or blemish (1 Pet 1:19) shed His precious Blood on the Cross, He died for us, in our place (1 Pet 3:18), the innocent for the guilty, so that we may have salvation, redemption and eternal life. 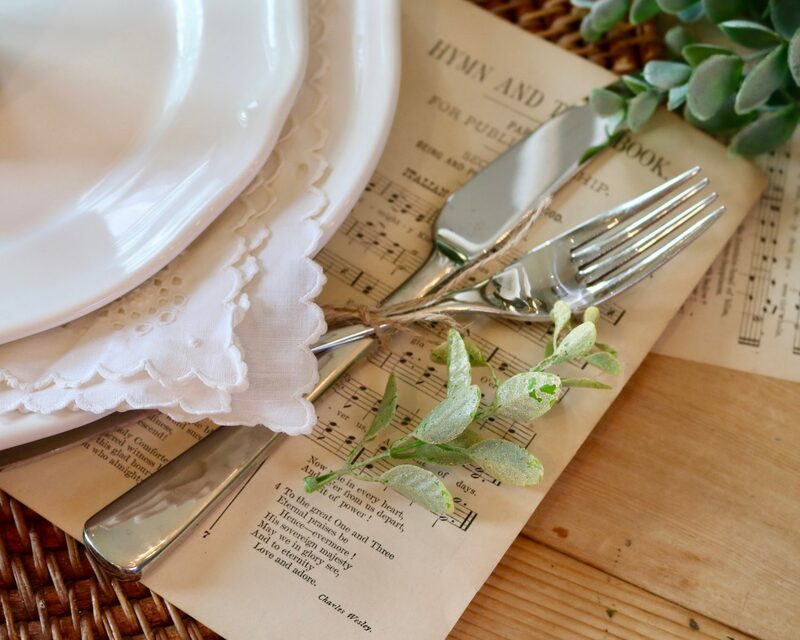 I was inspired by the beauty of an antique hymnal to create a simple yet meaningful tablescape for Easter. 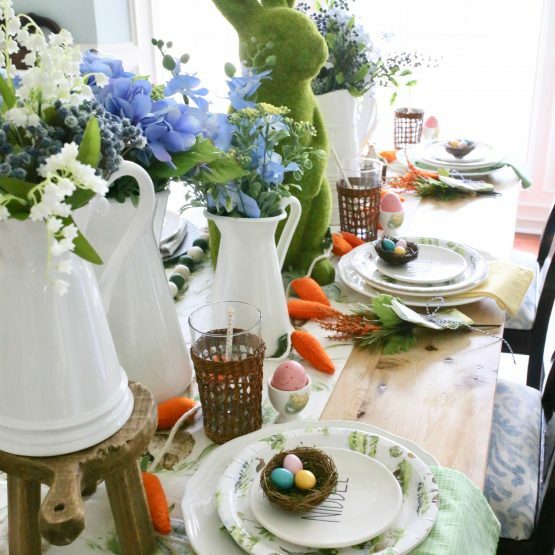 So even if you do not have a lot of holiday decor, you can pull off a beautifully decorated table for your Easter meal with your standard dishes, home decor and a vintage books. 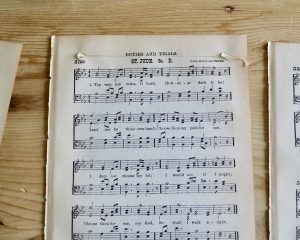 While it may seem destructive to paint antique wood furniture or tear pages from an old hymnal, I believe that items should be enjoyed and not just stored in an attic. If that means altering its original state to make it your own, I think that is okay. 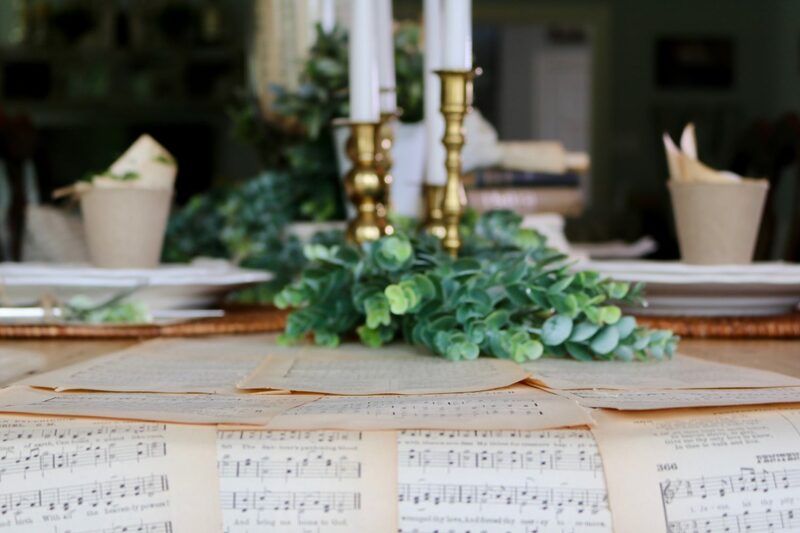 The centerpiece of the table consists of glass jars filled with old hymnal pages, greenery and a few vintage books. 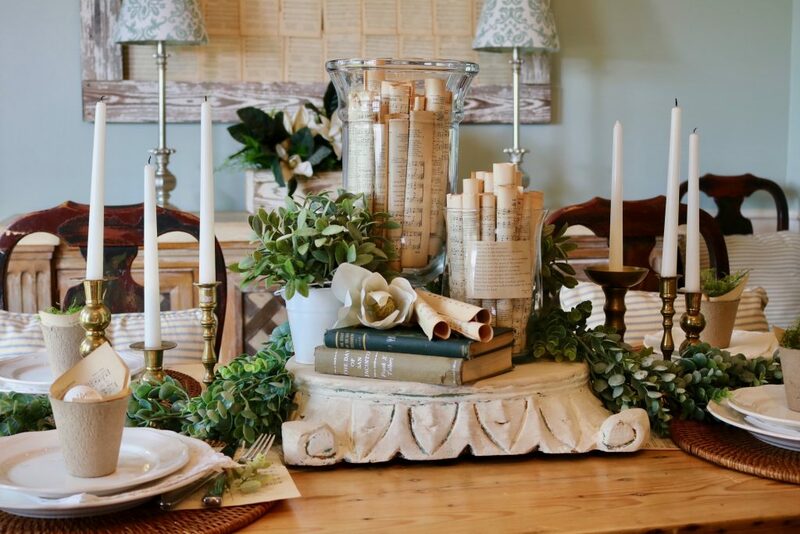 Placing the items on a pedestal sets them apart from the rest of the decor to create a statement piece in the center of the table. 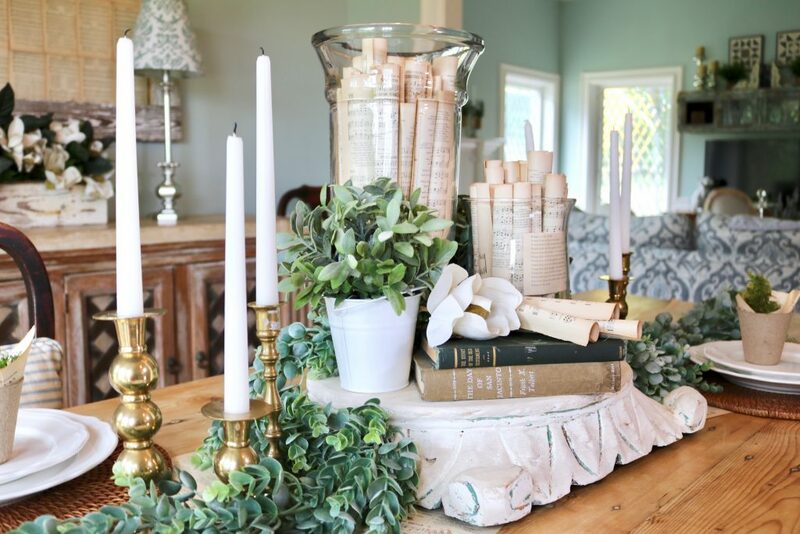 Above the table runner of vintage book pages, I placed two swags of Eucalyptus stems on both sides of the centerpiece along with my collection of vintage brass candlesticks. 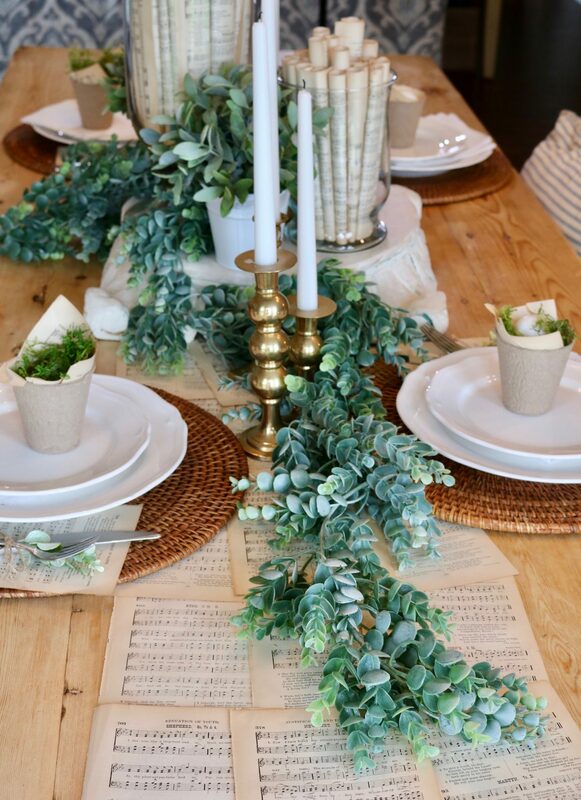 I used white candles for a simple, crisp look which contrast well against the metal and greenery. 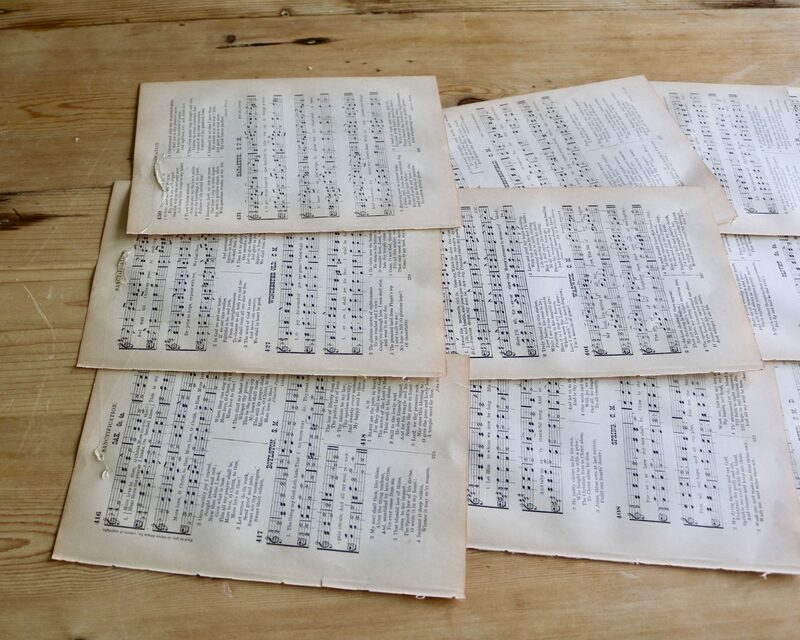 I created a table runner from the pages of the hymnal by overlapping pages in sets of three. 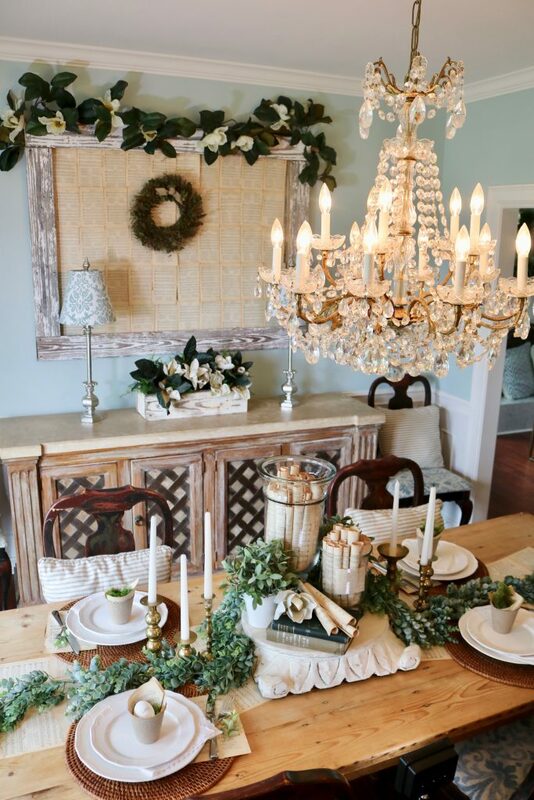 The table runner hangs off both ends of the table for a more dramatic effect. 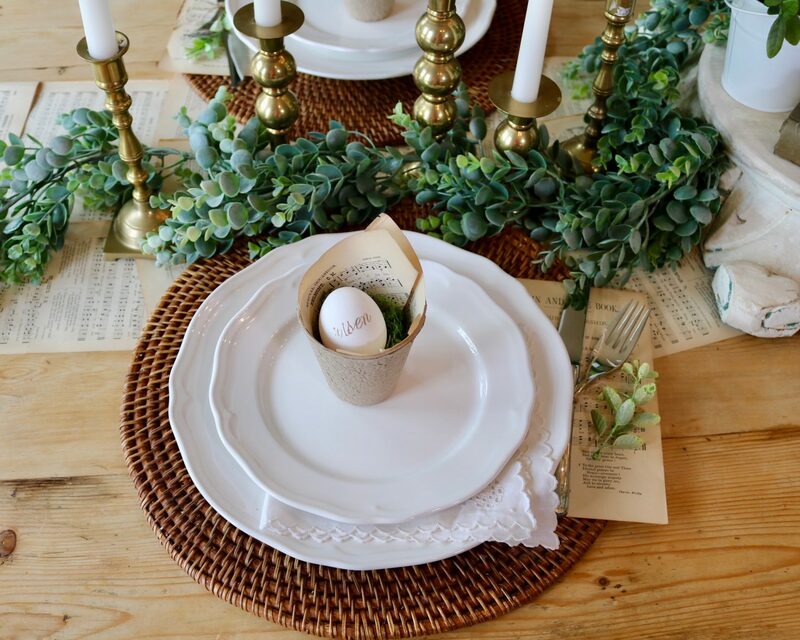 For the place setting, I used my Pier 1 rattan chargers which offer a natural element, vintage linens, crisp white Ikea dishes topped off with an Easter egg in a paper pot. I used jute string to tie the silverware together, a sprig of greenery and placed it upon a page from the hymnal. 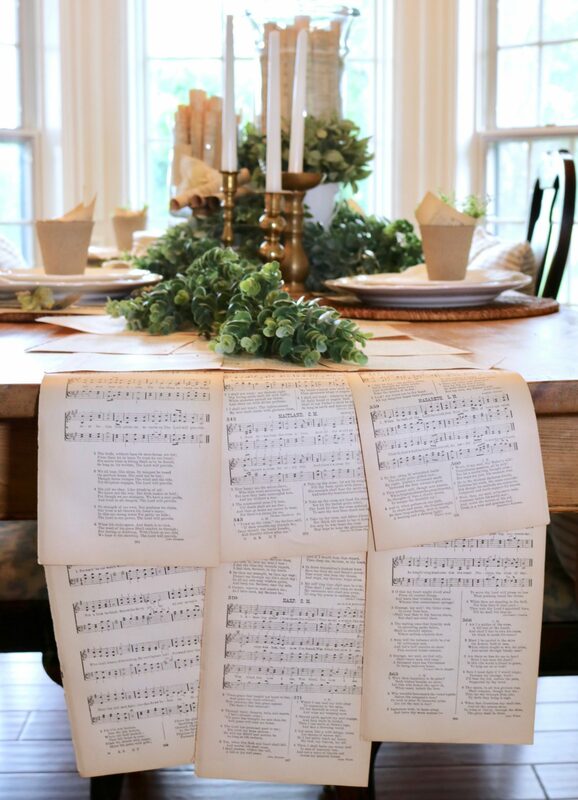 I hope my family will stop to enjoy reading some of the verses from the old hymns as I caught myself doing many times while setting the table. In the center of the plates, I placed a natural paper pot and filled it with a page from the old hymnal, moss, and an egg wrapped in gold stickers. 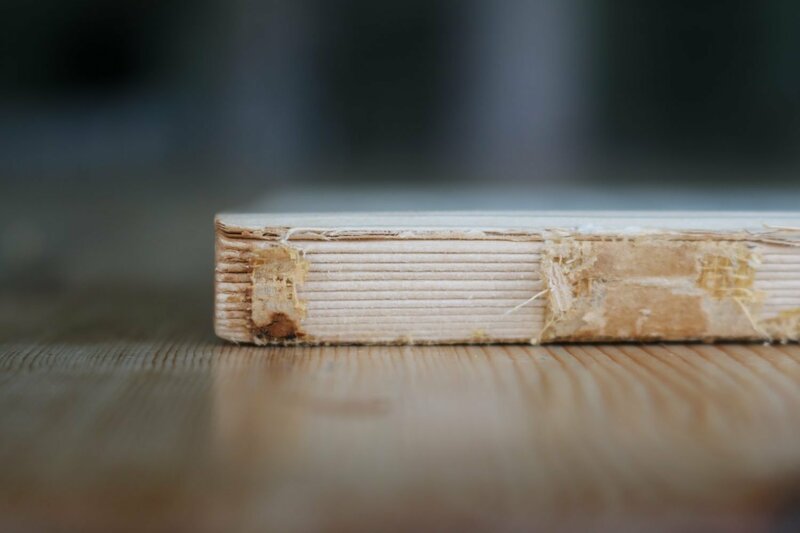 There is simplicity and beauty in vintage books. 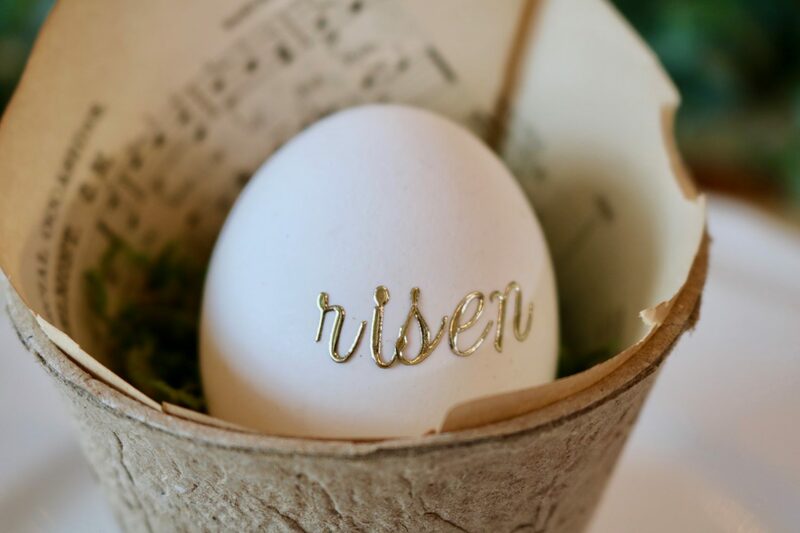 He is risen… He is risen indeed. 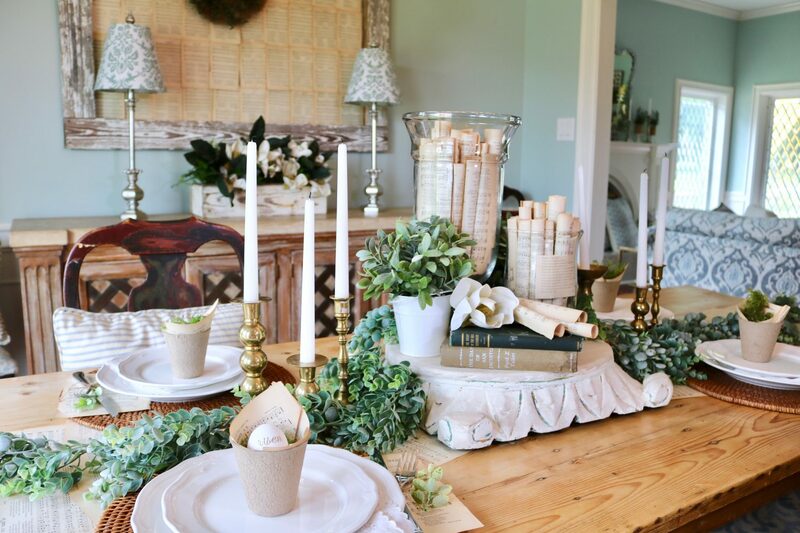 Again, I wanted to create a tablescape using items that I already owned. 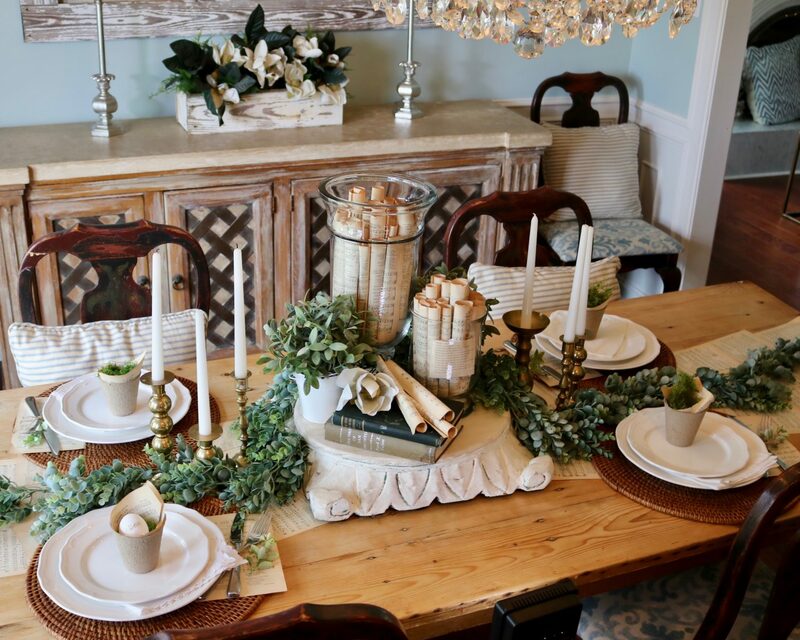 I think if you purchase classic, neutral dishes and decor, they transition well and last for years. 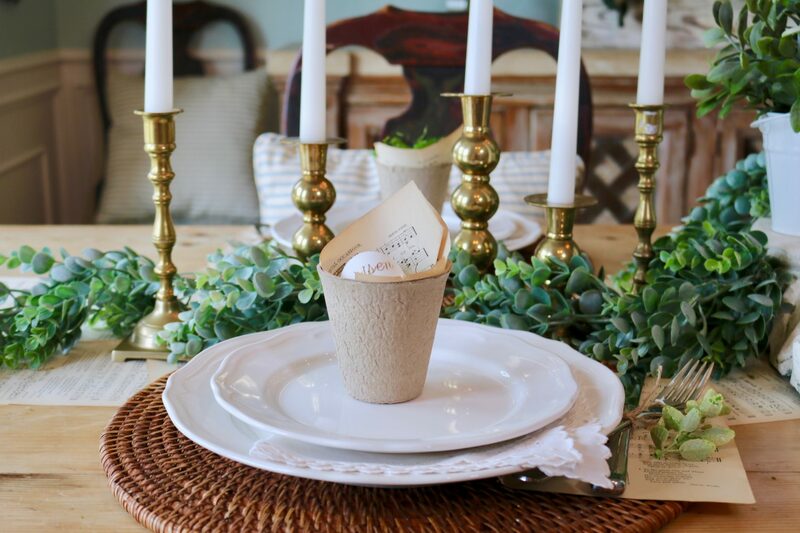 You can dress them up or down, and add a few simple touches of color, patterns, or decor to change the entire theme of the tablescape. Clear glass jars are a good purchase because of their versatility and low cost. I have had some jars for 10-15 years and use them a lot for holidays and parties. I often fill them with assorted color coordinated candies at kids birthday parties, turn them into snow globes or fill them with ornaments at Christmas, and use them to display candles with greenery. I have used them to hold pretzels and marshmallows for the chocolate fountain, art supplies for craft parties and mini pumpkins in the fall! Glass jars are something that you want to put in your decor closet. I love the ones on pedestals and the apothecary styled ones the most. For this table, I filled them with rolled up pages. I often donate clothes to the thrift store. 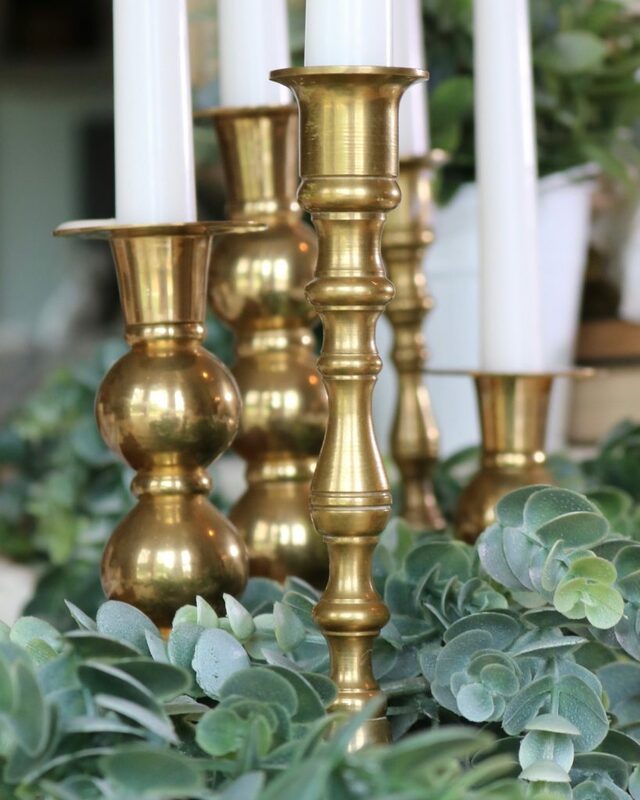 When I drop off items, I look for unique, vintage finds like these brass candlesticks. I found this set originally from Crate & Barrel for $6. 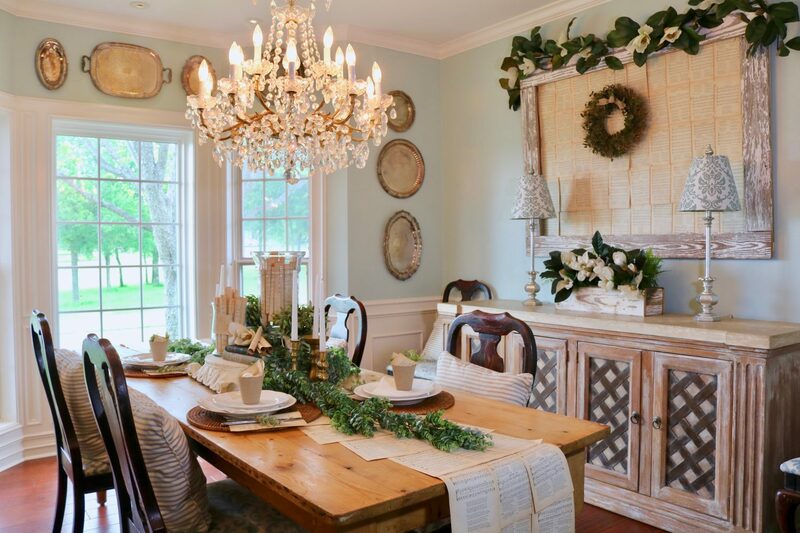 The silver platter wall is created from junkin’ finds from the antique stores in Waco, Texas. Did I mention that ‘Vintage and Glam, are just my jam? !’ Yes, I am an eclectic girl! 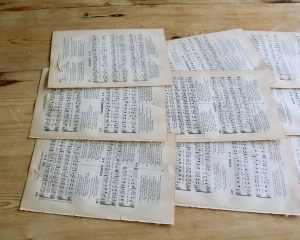 I tore lots of pages from the old hymnal, using glue dots to adhere, to create a unique wall art. 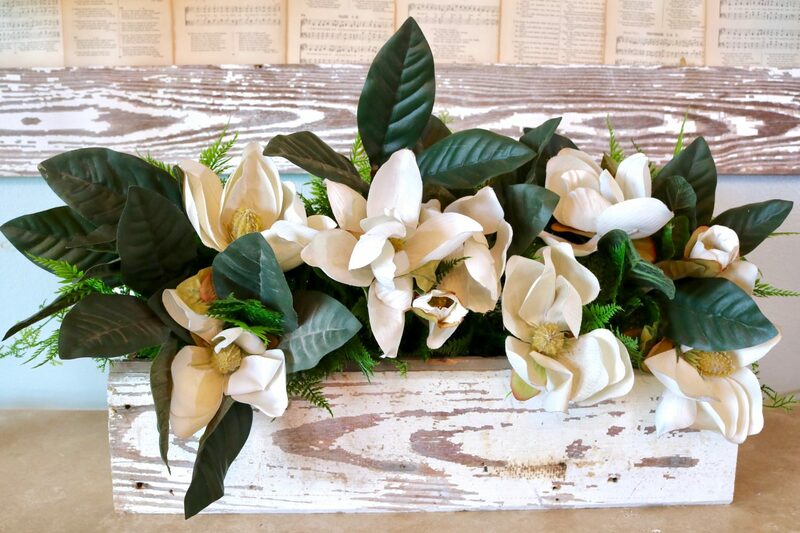 Some magnolia leaf swag and stems in a chippy crate contrast nicely. 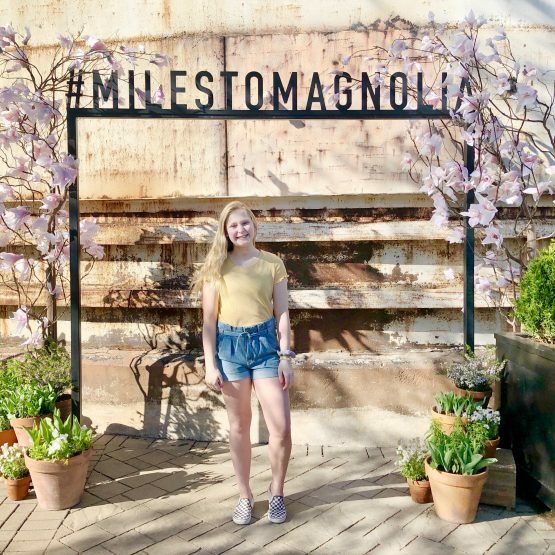 I need a magnolia wreath or two in this space! Like seriously, am I the only person who loves to decorate but has yet to buy one? 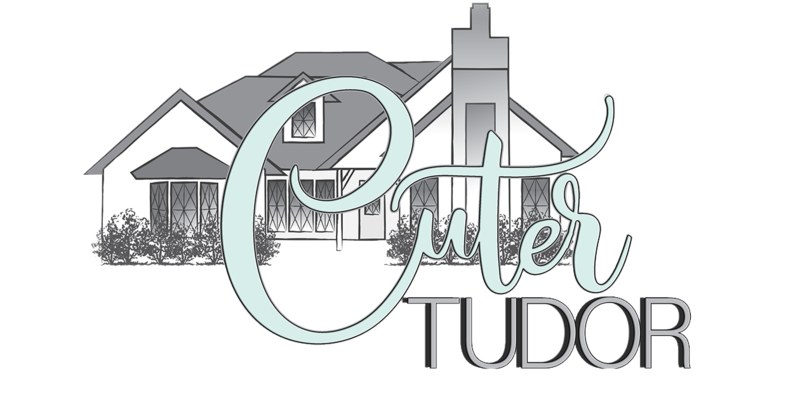 I was trying to use what I have and be budget friendly, but this may be a decor emergency! 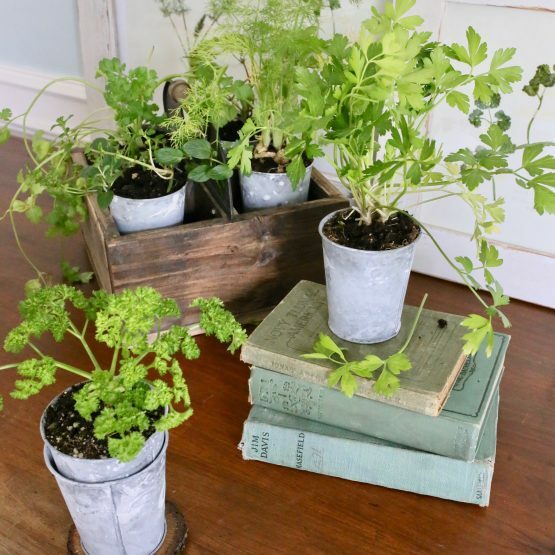 I made this DIY crate from chippy farmhouse wood in another post, if you need the details. Otherwise, I just added some magnolia stems to the crate of greenery. Remove the cover and spine from the outside of the book. My vintage book was over 115 years old so the cover was already very loose. 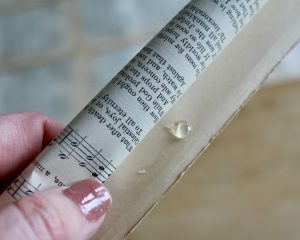 By removing the binding and glue strip from under the spine, the pages should tear freely depending on the condition. 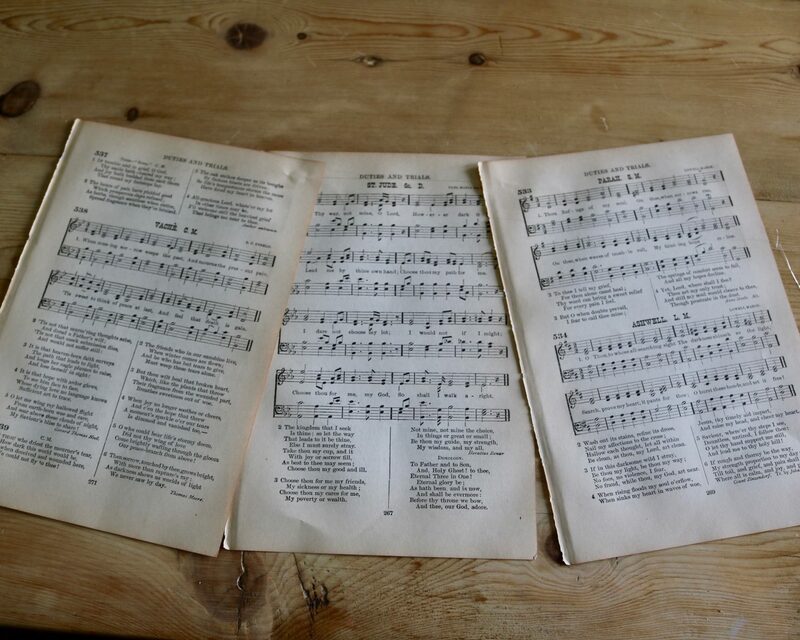 The picture below shows the the glue strip removed in most areas which allows you to tear the pages out. To get a clean tear, I held the book in place with one hand. At times, you may need to cut the page loose with an exacto knife, but a kitchen knife works too. I rolled the page vertically and used a dot of hot glue on the inside edge of the page to adhere. 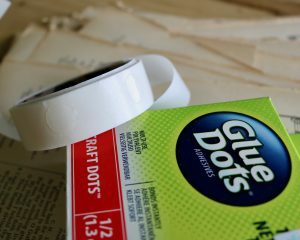 To stick the pages on the wall, I used ‘glue dots’ which also work to hold the rolled pages together. Glue dots are available at any craft store. 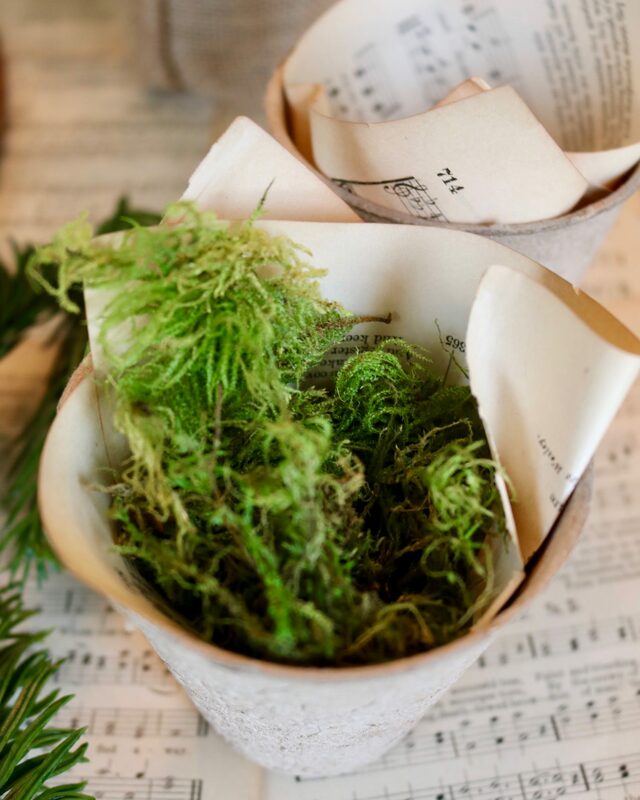 I used natural pots intended for seedlings for the place setting. 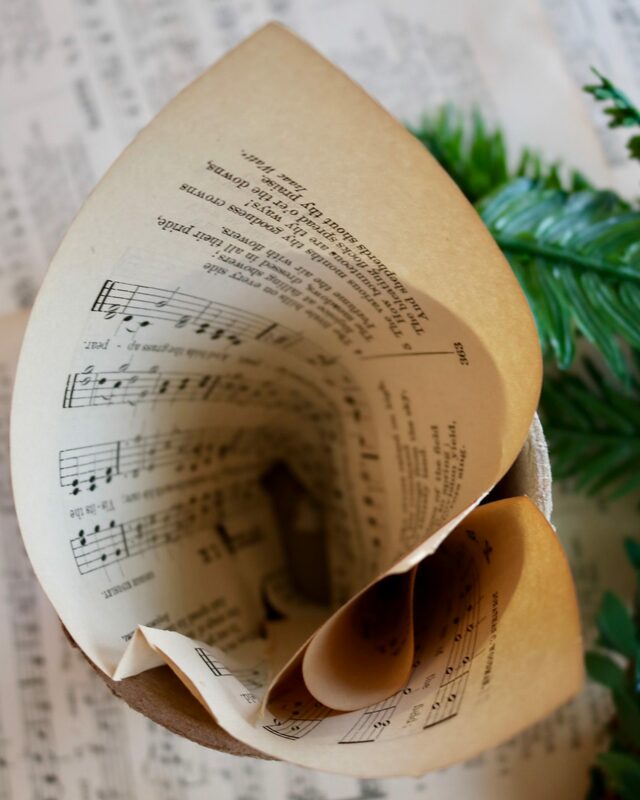 Simply, fold the paper into quarters, open slightly and push into cup. Add moss. Place any type of egg, boiled or faux, inside the cup. 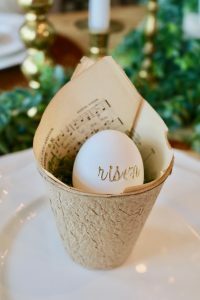 I searched my box of stickers for letters to personalize the eggs, but you can also use a permanent marker to write the name of guests or family members. To create the table runner, I laid 3 sheets of paper next to one another, adding a dot of hot glue to the outside edges of the center page. Then I placed the outer pages slightly overlapping the center page. I made several sets of these at a time. Then I added hot glue in several places along the top of the 3 glued pages, laying another set of pages over the top of the next to create an overlapping effect. Because I wanted the pages to be facing upwards as they hung off both ends of the table, I had to rotate the direction of the pages in the center of the table runner. Otherwise, if you overlap the pages in one direction, one side will hang upside down. 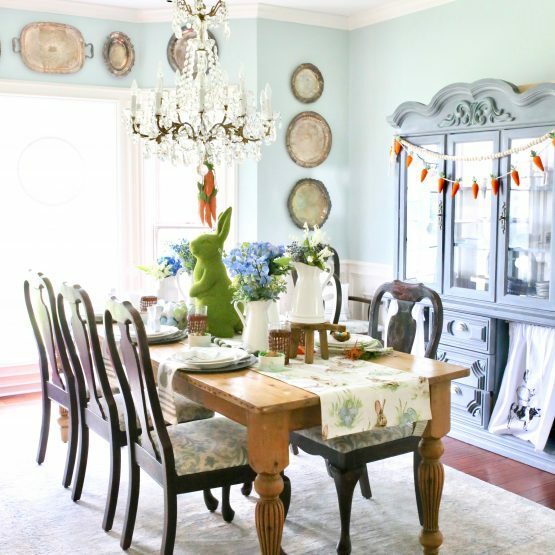 Thanks for checking out my vintage book inspired Easter tablescape using an old hymnal! Happy Easter!! 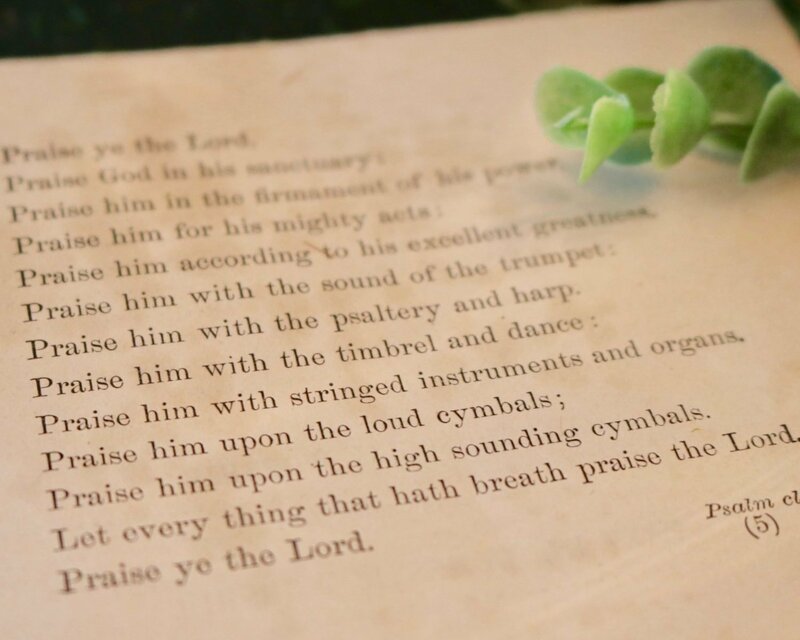 Praise ye the Lord, God Almighty for He is good! Our sins have been washed away.